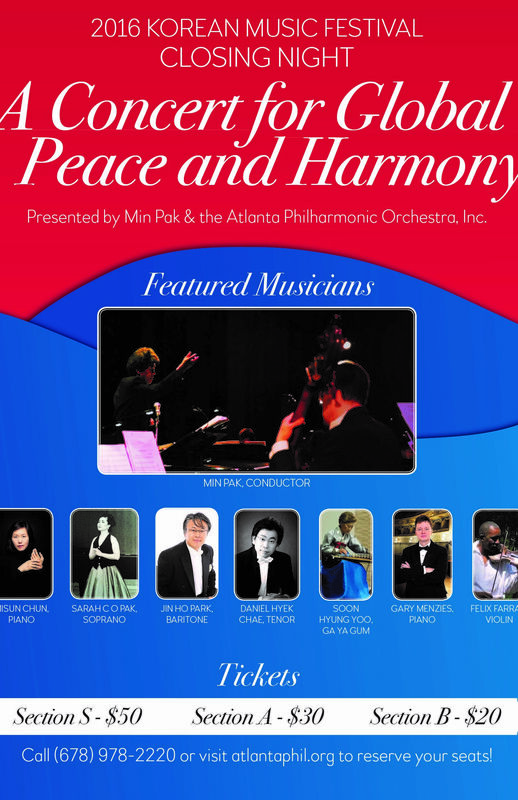 The Atlanta Philharmonic Orchestra, Inc. (Non-Profit, 501(c)(3)) and Director Min Pak presents the Global Peace and Harmony Concert, a contribution towards a peaceful world. This concert is specialized in Korean tunes including beautiful Korean folk songs and art songs along with your favorite classical music. Tickets: $20 and up. When you pay with Credit/Debit Card or PayPal and your receipt will be sent to your phone/email right away. You may pick up your tickets under your PHONE NUMBER with showing your receipt at the door. 2017 K- MUSIC FESTIVAL with Atlanta Philharmonic O..
대한민국 음악제 2017 Min Pak & Atlanta Phil..
대한민국 음악제 2016 “Korean Music Fest..
(Atlanta) Sumi Jo's 30th Anniversary - La Pri..
2016 KOREAN Music Festival , Thank you very much!